Business process management is critical to the way that nearly all organizations operate. That’s because business processes lay the foundation for back-office and front-office business functions — from managing invoices and records to quickly opening customer accounts and offering real-time promotional offers to prospects. At the end of the day, business processes allow all the different parts of an organization to efficiently and effectively work together toward their common goal of serving customers better. In the past, most organizations used BPM to achieve cost savings and productivity gains. But more recently, BPM has evolved to focus more on better serving customers. This emphasis on creating exceptional customer experiences has motivated companies seeking to remain competitive to adopt BPM practices and acquire BPM software. IBM has already helped thousands of clients from a wide range of industries successfully meet their business process improvement goals. We can help you chart your own roadmap to process improvement success that meets your business’ unique needs, without breaking your budget. Successful BPM projects require you to discover and document your processes. Get started with IBM Blueworks Live — a secure business process mapping and modeling solution hosted on the IBM Cloud, allowing non-technical end users to capture and share process knowledge and easily build models that can be exported into BPM for automation. 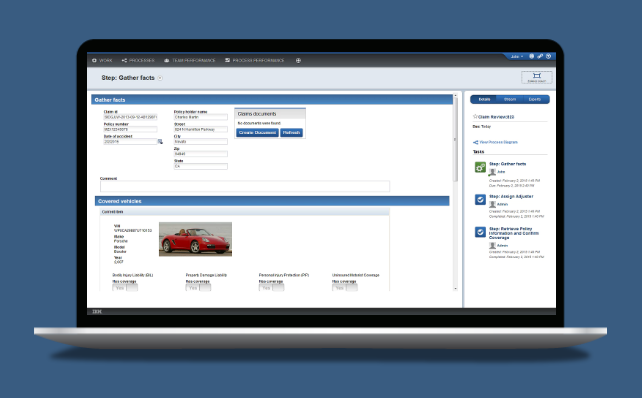 IBM Blueworks Live is a business process modeling tool that lets you discover, map and document your processes. It is easy to use and accessible anywhere through a browser. The cloud-based environment allows for effective collaboration in a way that is structured and usable by anyone in your company. Tutorial videos guide you through creating and editing a simple process model, allowing you to learn and perform business process modeling in minutes. ​Easy and intuitive to use: Get started quickly with business process modeling with no training required. Single source of truth: Keep teams in sync with a central, shared repository of all business processes that's always up to date. Team collaboration built-in: Work collaboratively with colleagues on the same process model, follow the items you care most about and post comments to share ideas. Automate workflows to present the relevant information for cases in context of content-related business processes like customer service, loan applications or claim adjudication. IBM Business Process Manager allows organizations to model, create and optimize critical business processes with speed and agility. IBM Business Process Manager lets your process owners and business users engage directly in the improvement of business processes. The full-featured, consumable platform includes tooling and runtime components for process design and execution, along with capabilities for monitoring and optimizing work. The platform supports mobile devices, features case management capabilities across its product editions and enables operations using a single process server or a federated topology. Access and prioritize tasks more easily: Take advantage of the task management capability to provide users with the right information at the right time, based on their roles. Enhance decision-making: Use the built-in visibility and analytics within the unified model-driven environment to help improve collaboration between IT and business teams. Manage initial startup costs: Enable business process management projects to start small with a subscription-based consumption model you can grow over time and scale smoothly from initial project to an enterprise-wide program. IBM Business Process Manager: This unified platform supports process improvement across a spectrum of work patterns, from straight-through processing to dynamic unstructured processes. IBM Business Process Manager on Cloud: This subscription-based BPM cloud service offers low startup costs and fast return on investment. IBM Business Process Manager Express: This entry-point solution is ideal for initiating BPM projects, providing an easy-to-use interface with a process execution, monitoring and optimization engine. Business Process Manager Tools: This edition enables you to model human-centric and straight-through business processes and cases.